Easily grown in average, medium moisture, well-drained soils in full sun to part shade. Prefers moist, rich soils. Spreads by self-seeding and bulb offsets. Plants are not reliably winter hardy throughout the St. Louis area where mulch should be applied in winter to help protect them from cold temperatures. In cold winter areas north of USDA Zone 6, tubers may be dug up in autumn, overwintered indoors and replanted in spring in somewhat the same manner as dahlias. Dracunculus vulgaris, commonly called dragon arum, is a tuberous herbaceous perennial that is native to rocky areas and hillsides in the central to eastern Mediterranean areas from Greece to the Balkans to Turkey. It typically grows to 3' tall and features large, erect, fan-shaped, palmately-divided, dark green leaves (to 12" long) that are often streaked with white. Each leaf has 9-15 finger-like lobes reportedly resembling in appearance the claw of a dragon, hence the common name. Leaves appear in clusters on a stalk-like, black/purple-spotted pseudostem. Large, foul-smelling, maroon-purple spathes (each to as much as 20" long and 8" wide) appear above the leaves in late spring/early summer. The foul odor of the spathes, sometimes described as akin to the nauseous aroma of rotten meat, attracts flies for pollinating the flowers. Each spathe envelops a central, upright, nearly black, tail-like spike (spadix) which is nearly as long as the spathe, but sometimes longer, with a diameter of only 1/2 to 3/4". The spathe contains inconspicuous, hidden, unisexual flowers. Flowers are followed by green berries which mature to orange-red in fall. 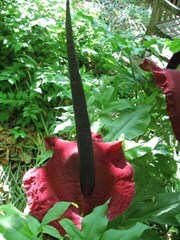 This plant is synonymous with and formerly called Arum dracunculus. Genus name comes from the Latin word meaning a small dragon. Shady garden areas. Avoid planting this perennial near windows, doors, sidewalks or other frequently populated areas where the brief but overpowering odor from the spadices will be found objectionable.